Many canola fields across the Prairies do not have the plant stands needed to meet yield potential. That’s according to surveys in Alberta in 2010 and Saskatchewan in 2012. 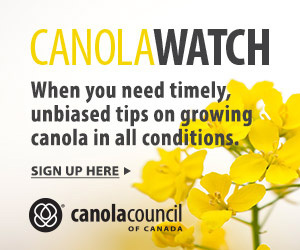 For the majority of canola producers, improved crop establishment would help their yields. This is one result from a survey of actual canola fields and interviews with the producers. Julia Leeson conducted the study to establish a baseline of producers’ canola crop establishment practices. In 2010, 218 fields were surveyed in Alberta, and in 2012, 464 fields were surveyed in Saskatchewan. 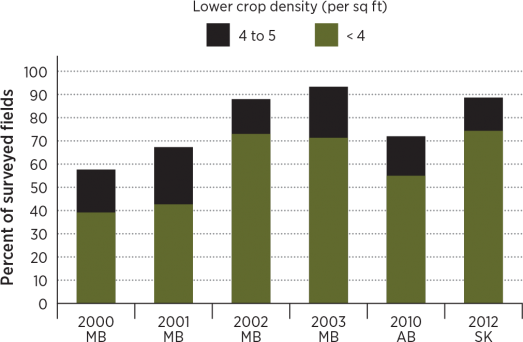 Manitoba data is from surveys conducted in 1,086 canola fields between 2000 and 2003. In general, producers appear to be targeting stand densities at the lower end of the recommended range. In years with extreme weather conditions, this often results in lower than recommended stand densities. Figure 1 shows that over 40 percent of canola fields surveyed in Alberta in 2010 and over 50 percent of fields surveyed in Saskatchewan in 2012 had overall average stand densities at or below the four to five plants per square foot threshold considered the minimum for canola to reach its yield potential. This is the overall average. Figure 2 shows that most fields have patches where the stand is inadequate to meet the crop’s yield potential, even if the overall average is above five plants per square foot. 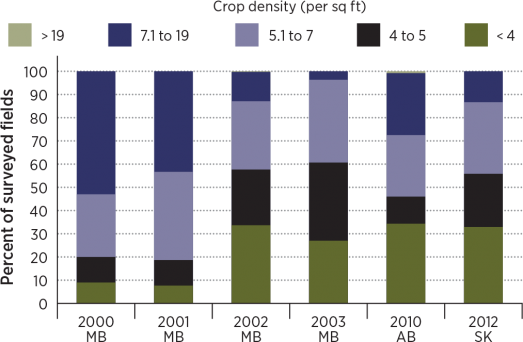 Over 70 percent of canola fields surveyed in Saskatchewan in 2012 had areas with fewer than four plants per square foot. In Alberta in 2010, 71 percent of producers surveyed reported a seeding rate of five pounds per acre and 11 percent used a lower rate. In Saskatchewan in 2012, 52 percent of producers surveyed reported using a seeding rate of five pounds per acre, and 33 percent used a lower rate. Weather can improve crop establishment, as survey results found. However, even under relatively good environmental conditions, Leeson concludes that approximately 40 percent of producers would benefit from better crop establishment. The study also measured the relationship between canola plant stand establishment and weed density. As expected, weed densities were higher in poorly established crops. This potentially means higher herbicide costs and a further reduction in yield due to weed competition. Figure 1. Average canola density in each survey year. Figure 2. Percent of fields with patches of less than recommended canola plant density in each survey year.